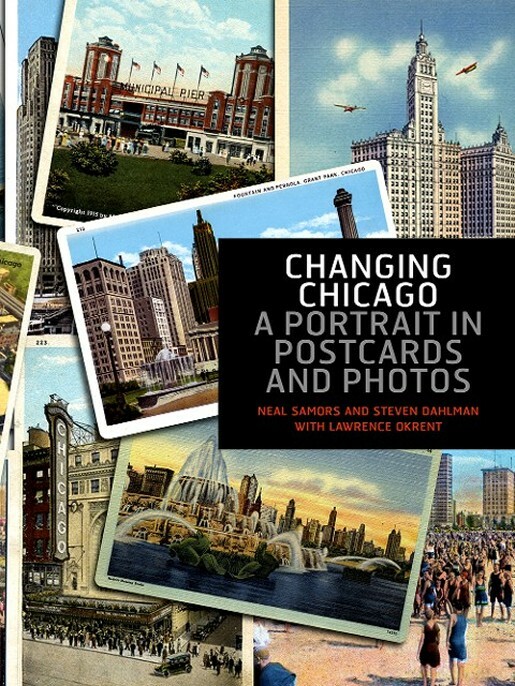 “PICTURE POSTCARDS PRESENTED THE WONDERS OF THE WORLD in color at a time when black-and-white photography dominated print media and travel was a difficult and expensive proposition,” Lawrence Okrent writes in his foreword to the sumptuously enjoyable Changing Chicago: A Portrait in Postcards and Photos (Chicago’s Books Press, $40). On the margin of one postcard showing the original Cook County Jail, someone, perhaps a mother, has written in a cursive hand: “This is where I will put you if you don’t behave.” People filled shoe boxes with postcards they’d received, bearing messages from friends and family on one side, and destination images on the other. In this lavishly produced, 208-page coffee-table picture book printed on thick, smooth (and aromatic) paper, the authors have collected and reproduced more than 200 vintage Chicago postcards and juxtaposed those images with archival and new photographs to illustrate how the city has changed in the 146 years since the Great Chicago Fire of 1871. Originally shot in black-and-white and then colorized by their publishers, such as Chicago printers Curt Teich & Co., the postcard photographs from the early to mid-20th century evoke a bustling, modern city whose energetic citizens also enjoyed plenty of leisure time at the beach or along the lakefront. That idealized, colorful evocation must have seemed dreamily exciting and appealing, and perhaps out-of-reach, to people in other parts of the country who received the postcards in the mail. The book organizes its images into locations and aspects of this beautiful American city, many of which remain central to daily life in Chicago today: the river (once churning with commercial ships and lined with docks and warehouses, now home to promenades, cafes and restaurants, where people watch pleasure craft cruise past), Wacker Drive, and Michigan Avenue (including the Water Tower, Tribune Tower, Wrigley Building, Michigan Avenue Bridge, and Art Institute of Chicago). Other entries are devoted to Chicago’s aerial views, its beaches, Board of Trade, Buckingham Fountain, churches, City Hall, Civic Opera Building, elevated trains, Lake Shore Drive, Gold Coast, Grant Park and Millennium Park. We see the evolution of the city’s harbors, Navy Pier, Merchandise Mart, Museum of Science and Industry, and Field Museum. Across glossy spreads pop Chicago’s parks, sports arenas like Wrigley Field and the Chicago Stadium, State Street (including Marshall Field and Company—now Macy’s—and the Chicago Theatre), other Loop streets, and landmark hotels like The Drake, Palmer House, and Blackstone. One thing that becomes apparent seeing the old postcards next to recent pictures of Chicago is the elegance its citizens and visitors—and the rest of the world—have lost. In vintage shots, ladies and gentlemen stroll in dresses and suits; in contemporary photos, slobs stumble in shorts and T-shirts. Some postcards are arranged one or two per page, others four or six per page. A few cover two full pages of the book—such as one showing Navy Pier in the 1940s, and another of Adams and State streets at the dawn of the 20th century. For Chicagoans, the book is a rare pleasure. Other readers might feel like the recipients of those postcards so long ago: They’ll wish they were here.